Lift & Lock/Sit & Stand/Dial & Tilt keyboard arm(model #60034 Series) - Sallas Industrial Co., Ltd.
Sallas designs and produces Overbed table, Medical cart, Mobile cart, Computer workstation cart, LCD arm, Keyboard arm, CPU holder for industrial, healthcare, finance, office fields etc. 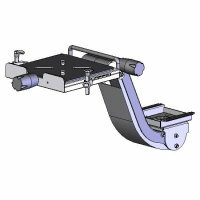 This Lift &Lock/Sit & Stand/Dial & Tilt keyboard support mechanism is rigged constructed for steady use and designed for mounting keyboard tray of various hole patterns available in the market. 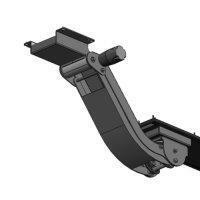 The spring assisted arm lift mechanism with innovative lift/lock device for effortless height and tilt adjustment. This keyboard arm is ideal for either sit or stand key in operation. Height adjustment total 14.5", up 7.5" over track/down 7" under track. Track of 560mm(22") long or 630mm(24-3/4") extra long are available for options. Teflon tracking sliders for easy movement. Spring assisted arm lift mechanism with tray tilt lift/lock device for effortless keyboard height adjustment. Arm side to side swivel. Keyboard tray tilt range -15° and +10°.